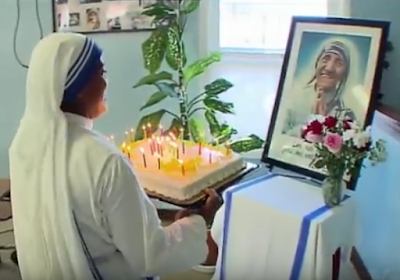 Wisdom Quarterly: American Buddhist Journal: Mother Teresa becomes official "saint"
Soon-to-be Saint Mother Teresa of Calcutta would be turning 106 today (VOA News). Through The Mother the world is glorified. This weekend the Blessed Mother Teresa is finally made an official "saint" of the Catholic Church, now that the Vatican's Office of the Devil's Advocate has been shuttered to make it easier for candidates to be advanced without significant obstruction. Even so, at breakneck speed, it has taken years for a living saint -- as recognized by the people of India -- to be declared a "saint" posthumously. Better late than never, but it would mean much more if the standards had not been lowered to the floor years before. The Church simply uses canonization as a propaganda tool nowadays so that the pope, its titular head, can canonize locals wherever he visits to encourage more recruits to the largest religion in the world. They don't have to be vetted very much, so Africa and China are now ripe recruiting ground even as Europe old faith loses traditional adherents in droves. (ODN) Saint Teresa of Calcutta (Kolkata), who was born Anjece Gonxhe Bojaxhiu, will be canonized on Sunday, September 4, 2016.